Full Metal Panic! is a military mecha comedy series of light novels by Shoji Gatoh, with several anime adaptations. Military maniac Sagara Sousuke is protecting Chidori Kaname by orders of anti-terrorist organization Mithril. Full Metal Panic! is a series of light novels written by Shoji Gatoh and illustrated by Shiki Douji. The series follows Sousuke Sagara, a member of the covert anti-terrorist private military organization known as Mithril, tasked with protecting Kaname Chidori, a spirited Japanese high school girl. The anime spanned 3 seasons, including a comedy centric Full Metal Panic? 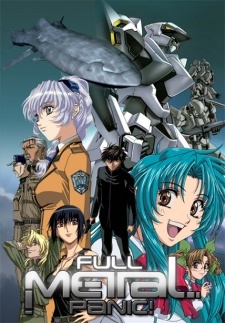 Fumoffu and a 3rd season Full Metal Panic! The Second Raid. The first season was produced by Gonzo, while the latter two were produced by Kyoto Animation (and, in fact, FMP? Fumoffu! was the first anime for which Kyoto Animation served as the lead production studio).